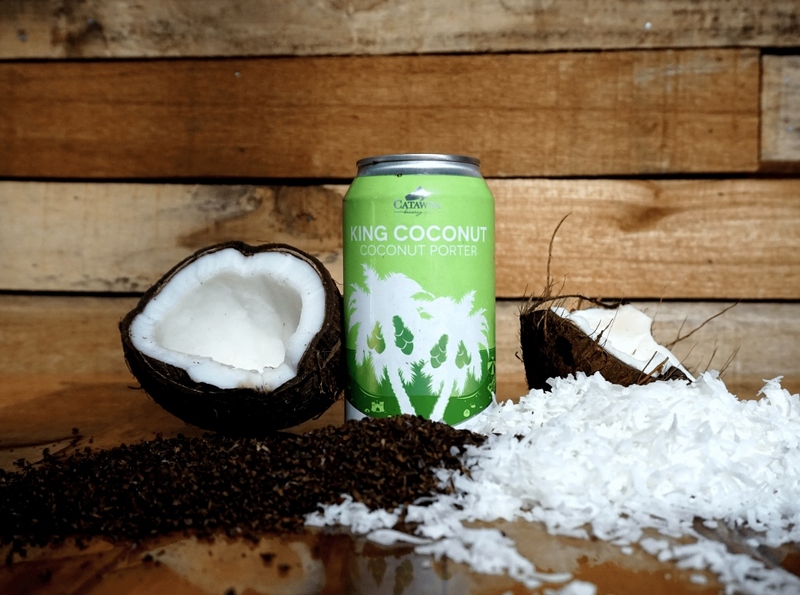 Western North Carolina’s original coconut beer, King Coconut Porter (5.5 percent ABV), returns to Catawba Brewing for its 14th year on Friday, February 2. This decadent “liquid candy bar” has traditionally seen a summer seasonal roll-out to celebrate its tropical side. But in 2018, Catawba is moving it up to late winter as an appetizer course before their eagerly-awaited Peanut Butter Jelly Time release on March 2. Luau theme parties will be held at all four Catawba tasting rooms in celebration of King Coconut Porter’s release on Friday. Find it on draft and in 6-pack cans throughout Catawba’s 5-state distribution area. Catawba taps a Small Batch Cascadian Dark Ale (6.2 percent ABV) on Thursday, February 1, available at all locations. Brewed in Asheville, this hybrid style is similar to a Porter with its roasty malt backbone, but lighter in body. Aromatic hops from the Pacific Northwest are the star ingredient, transforming the beer’s familiar dark ale flavor profile into a uniquely American creation with complementary notes of citrus and hop resin. Cascadian Dark Ale is Passport Beer #5 in Catawba’s 2018 Small Batch rewards program. Also on Friday, February 2, Catawba releases their Friki Tiki Clementine IPA (6.5 percent ABV). The latest in a monthly series of fruited IPAs features a citrus-forward hop profile, enhanced by an addition of juicy, sweet clementines. Brewed in 30-barrel batches at their Morganton production brewery, these specialty beers will see a limited draft-only roll-out throughout Catawba’s distribution area. Founded in 1999 by the Pyatt family, natives of Western North Carolina, Catawba Brewing operates a main production facility in downtown Morganton, NC at 212 S. Green St; a boutique brewery/tasting room in downtown Asheville, NC at 32 Banks Ave; a tasting room in Asheville’s Biltmore Village at 63 Brook St.; and a new Catawba brewery/tasting room in Charlotte’s Plaza Midwood neighborhood at 933 Louise Ave. Catawba beers can be found in NC, SC, TN, AL, GA, and now in the Dominican Republic.